Picturesque Rioja, Spain’s most prominent wine region, is a new world within a very old world. Winemaking here dates to Roman and medieval times, and today modern wineries designed by Gehry, Calatrava, and other celebrity architects flourish alongside traditional villages. Lavishly illustrated with photographs of the people and landscape and with detailed maps, this guide ranges over a diverse area from Rioja to Navarra, Bierzo, Galicia, and the Basque country as it explores winemaking from the ancient to the traditional and modern. 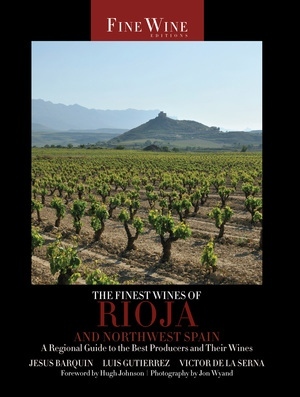 Written by a trio of experts on Spanish wine, it provides insider information on a region home to Spain’s finest Tempranillo, its prestigious Albariño, and many other indigenous grape varieties such as Garnacha, Mazuelo, and Viura. The authors look in depth at topics including climate and soil, grape varieties, and viticulture, and profile more than 85 individual wineries. They also include information not available elsewhere: several top ten lists plus “secret addresses” for the best restaurants and shops in which to find aged and historic vintages of Rioja. Jesús Barquín is professor and director of the Institute of Criminology at the University of Grenada and an expert on Spanish wine and sherry who received Spain’s national gastronomy prize in 2006. He writes on food and wine for elmundovino.com and is a regular contributor to The World of Fine Wine. Luis Gutiérrez is a wine writer for the El Mundo newspaper group in Spain, a columnist for blueWine magazine in Portugal, and a contributor to The World of Fine Wine. Víctor de la Serna, a journalist and editor at El Mundo, is a highly regarded wine writer.